Ryan shares, “it was definitely the most life-changing experience that I would never have asked for.” The months in the dark forced him to make drastic changes not only in his physical health, but also in his mindset towards himself. He had to overhaul his nutrition and sleep patterns in order to recover. No more caffeine, sugar, alcohol, staying out late, or sleeping in. He became more intentional with his time, giving space for reading, self-improvement, meditation, and reflection. When he was ready to take steps towards training again, he got in contact with a sports psychologist and a performance coach to help him stay holistically healthy. Finally, eight months after his injury, Dodd strapped on his skis for his first competition and scored a personal best. That milestone was followed shortly after by a first place victory at the the US Masters and a world title. During his recovery, Ryan read a book that encouraged him to “turn obstacles into opportunities.” He used to view defeat or challenges as negative experiences, rather than moments to evaluate and grow. This shift in his mindset enabled him to take his recovery day by day, and has marked his career ever since. He learned that focusing on doing his best would always take him further than dwelling on the next big win. Performance goals remain important, but he has found that small, attainable goals in all areas of life are actually more rewarding and motivating. 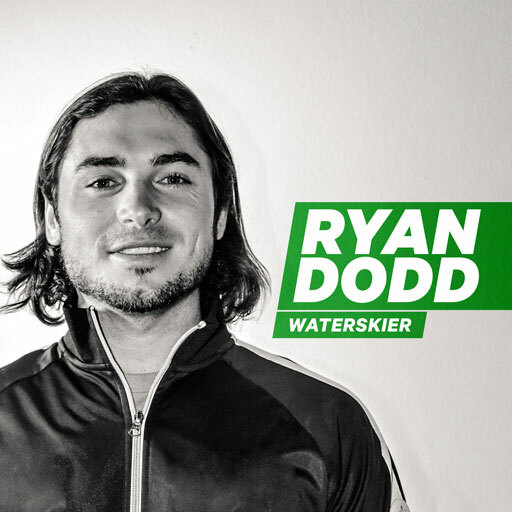 Although he’s back to skiing professionally, he shares that he is dreaming bigger than just gold medals and championships – he wants to help evolve the sport, encourage others, and mentor younger athletes. He currently trains with his dad, who has was titles in the Over 55 water skiing circuit himself, and looks forward to bettering himself at each competition in the coming year.